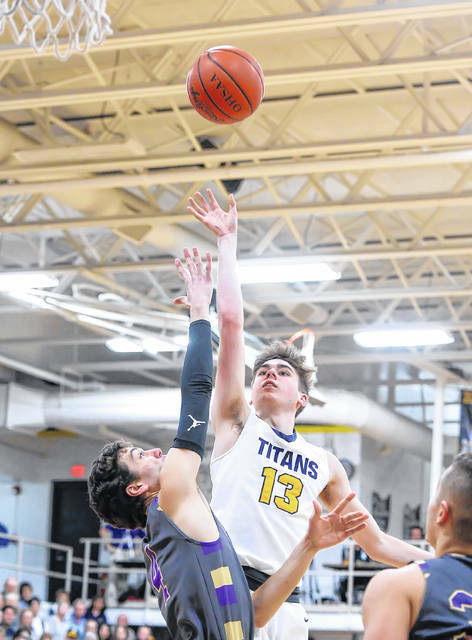 Ottawa-Glandorf’s Ben Westrick puts up a shot against Lexington’s Cade Stover during Saturday night’s game at Robert J. Hermiller Gymnasium. 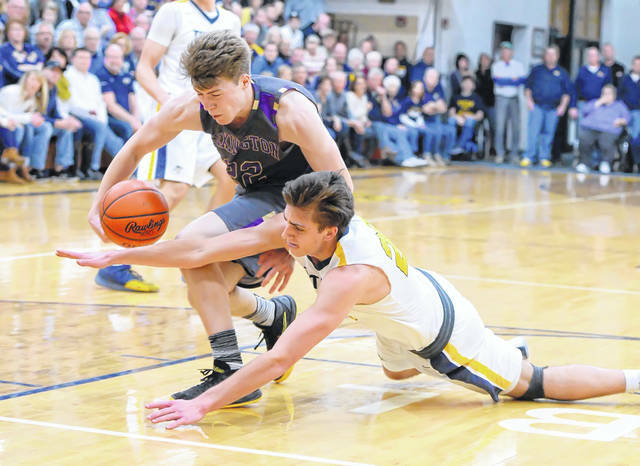 Ottawa-Glandorf’s Ethan White dives for a loose ball against Lexington’s Josh Aiello during Saturday night’s game at Robert J. Hermiller Gymnasium. Ottawa-Glandorf’s Owen Hiegel drives against Lexington’s Kyle Johnston during Saturday night’s game at Robert J. Hermiller Gymnasium. Ottawa-Glandorf’s Carter Heringhaus puts up a shot against Lexington’s Nick Stehle during Saturday night’s game at Robert J. Hermiller Gymnasium. 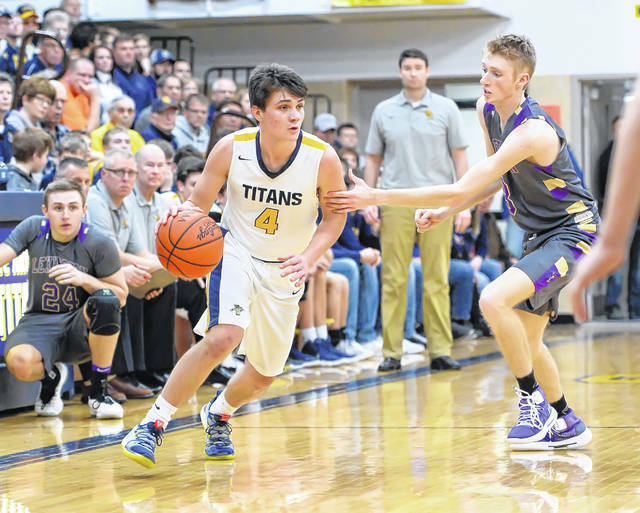 OTTAWA — They seem to do this every year, so the closeness of Lexington’s 52-50 boys basketball win over Ottawa-Glandorf on Saturday night shouldn’t surprise anyone. Two years ago, O-G came away with a one-point win over the Minutemen at home. Last year at Lexington, it was the Minutemen who took a one-point win. It has developed into a series where both teams leave the floor knowing this game probably did them some good regardless of which side of the score they were on. “I told the guys before the game there’s one reason, one main reason that we have these guys on our schedule. It’s because of the quality of the program that they have over here, year in and year out. It’s that level of competition we like to play,” Lexington coach Scott Hamilton said. “We played them three or four years ago in a regional semifinal and I knew I wanted to get these guys on the schedule and play them every year,” he said. Ohio State football recruit Cade Stover scored 19 points and had 13 rebounds to lead Lexington (14-4) and Kyle Johnston had 13 points. 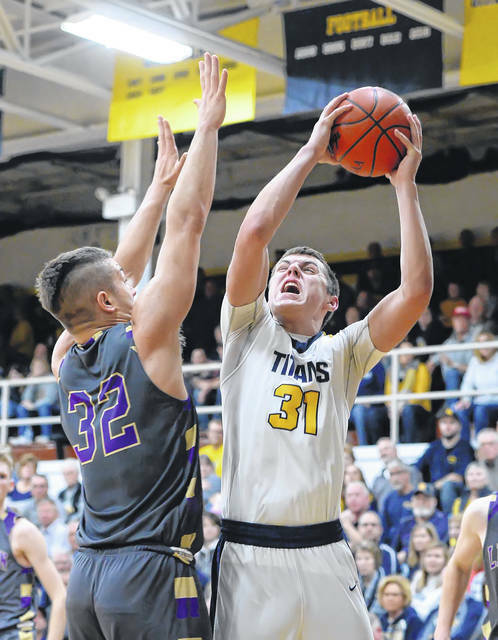 Ethan White scored 14 points, Owen Hiegel had 13 points and Ben Westrick pulled down 11 rebounds for Ottawa-Glandorf (15-3). Ironically, what was working best for O-G when it jumped out to a 17-11 lead late in the first quarter turned into its biggest struggle the rest of the game. The Titans’ first 12 points came on four consecutive 3-pointers by White and they were 6 of 11 shooting the ball in the first quarter. But over the final three quarters, they connected on just 12 of 46 field goal attempts (26 percent). “We missed some really good looks. We didn’t shoot the ball well,” McGlaughlin said. “Obviously, they contested a lot of shots and did a really good job on the defensive end. We just didn’t have one of those nights we normally do shooting the ball. “Tonight we never got that big turnover. We got some stops but we didn’t get the turnover that led to a lay-up or an uncontested three in transition. When you play a team like that you need some of those bursts and tonight we didn’t have it,” he said. Ottawa-Glandorf led 23-21 at halftime and extended that lead to six points, 29-23, on a 3-pointer by Hiegel two minutes into the second half. But a 13-2 Lexington run over the last six minutes of the quarter put the Minutemen in front 36-31 after three quarters. O-G battled back to take a 48-47 lead with 1:58 to play on a 3-pointer by Brennan Blevins. A bucket by Stover got Lexington back in the lead and a free throw by Kaiden Berry made it 50-48 before Hiegel tied the game at 50-50 on a drive to the basket with 27 seconds left in the game. Stover got loose inside for a bucket that made it 52-50 with five seconds to play. The Titans got a timeout with 3.6 seconds left but Hiegel’s long 3-point attempt just before the buzzer bounced off the back of the rim. Hamilton said, “We knew a lot of their points come in transition off their defense and the 3-point line is a huge weapon for them. They play at a little bit higher energy level than we usually see. When it started off we weren’t used to that. But I think the guys adapted to that and we were able to get out on them and contest them a little better. “We knew they were a high-scoring team. Once we felt we had them in our wheel house and kept them at that level of scoring, our guys felt pretty good and our confidence just got better,” he said. This entry was tagged ottawaglandorf. Bookmark the permalink.